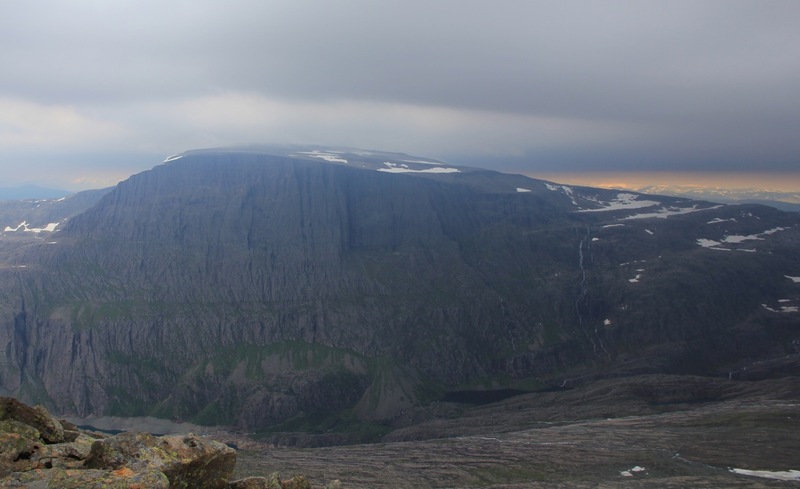 This mountain is located west of the better known Gjegnen. The mountain is a pretty long ridge, generally running north to south. A good point of reference is the small village of Ålfoten. One can get to Ålfoten from the larger town of Nordfjordeid (north of Nordfjord) by driving about 15 kilometer west to Ytre Rød, then take the ferry across to Isane on the south side of the fjord. Drive a few kilometer east, go through a tunnel, then look for a left fork signed for Ålfoten. Measure from here. Alternatively, one can drive to Ålfoten from the large town of Førde. First drive on Hwy. 5 towards Florø, then turn (right) onto Hwy. 614 that continues to Ålfoten via the town of Svelgen. From the fork where you leave Hwy. 614, continue 4.5 kilometer going through the small village of Ålfoten. At this point, turn left onto a private road (owned by the local power plant). At kilometer 6.3, you enter the power plant and at kilometer 6.7 you will pass a gate (hopefully open!). At kilometer 11.3, you will have a parking area on your right. The (almost dry) creek from lake Dauremålsvatnet comes down to the fjord here. There is a marked route from here and up to this lake. This is where we started, location N61.83907, E005.72648, elevation about 15 meter. Note: This (private) road is unfortunately, not on the current maps. It turns out that this road runs a long way and that it almost certainly provides a much better trailhead between Tennevatnet and Storevatnet, a bit east of north relative to the summit of Bukkenibba. It appears that such a trailhead would be located near a road fork at location N61.83009, E005.78135, elevation about 400 meter. If the road that forks right can be driven, one may even start nearer to 475 meter of elevation. One can then ascend to point 594 and follow the main ridge directly to the summit. Such a route would be (YDS) class 2. 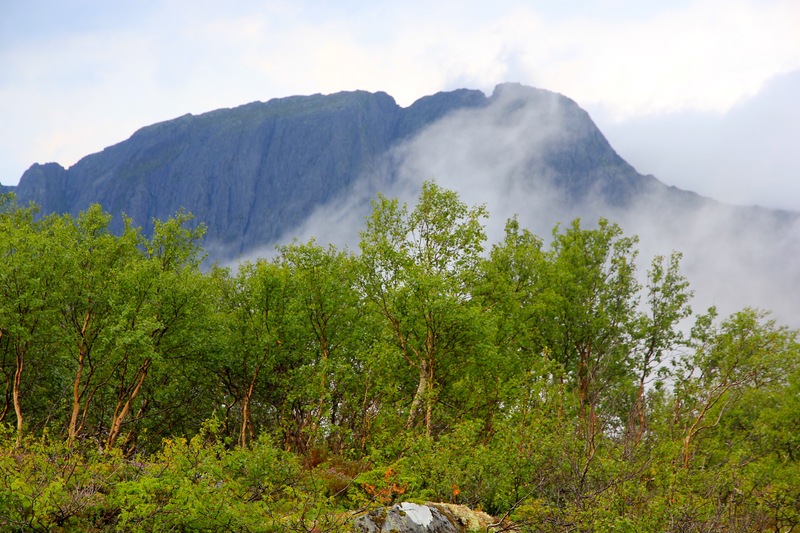 This description starts at sea-level at the trailhead north of lake Dauremålsvatnet. Note the comments above, there may be a much better trailhead. Walk uphill just right of the creek. You will soon find a small, red arrow made of wood that indicates the route uphill. The route continues uphill and there are several more red markers (arrows) as well as some red paint on trees. Unfortunately, we lost the this trail, but somewhat more patience will pay off if you search for these red markers. This hillside is very steep, on average close to 45 degrees, and the markers show a feasible route, there is really no visible trail. At about 400 meter of elevation, the terrain levels off and travel/hiking is easier. 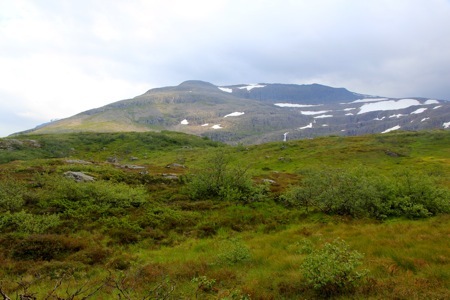 Do not continue towards lake Dauremålsvatnet, rather turn more left (east) and access the lower (almost flat) parts of the ridge from Bukkenibba. Such a route will avoid cumbersome terrain (large boulders among trees) on the more direct route to the lower part of the ridge. Once on the ridge, ascend towards a steeper section, but turn these cliffs on the right (west) side. Follow the cliffs as you ascend higher and eventually regain the main ridge. There are quite a few rock markers as well as a couple of cairns that indicate a good line uphill. Once you gain the small point 1412, the rest of the ascent just follows the top ridge. The remaining ridge is about 1.3 kilometer with several false humps. In particular, you pass a big cairn pretty early along this ridge route. 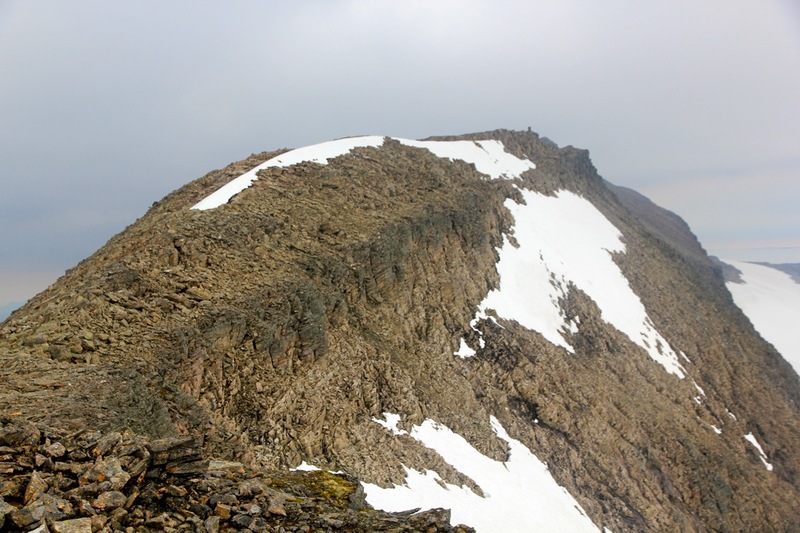 The summit has a small cairn and the ridge gets broader as it slopes (to the south) downwards from this point. 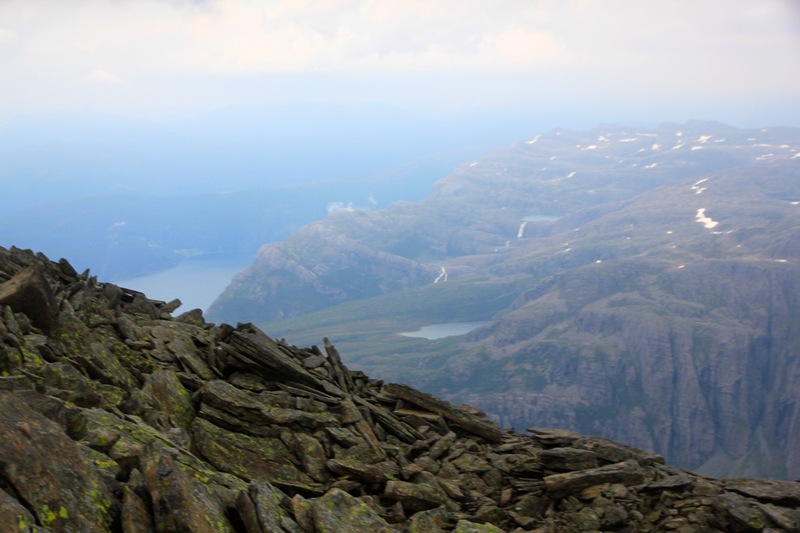 I climbed this peak with my son Pål Jørgen. We started the day at Rondvassbu after a very nice climb of Sagtinden the previous day. Walking quite fast got us back to our car (outside the national park boundaries) at Spranget in a bit less than one hour. 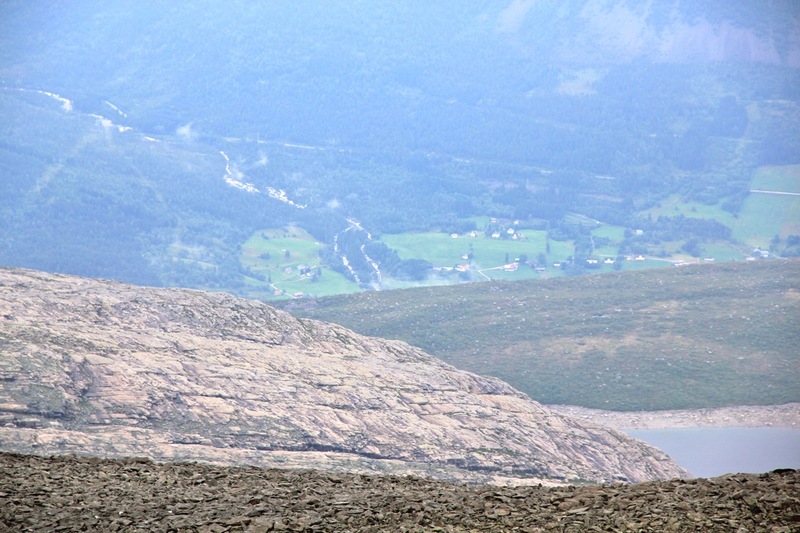 We began our drive back to Bergen, but agreed that a mountain should be climbed along the way. 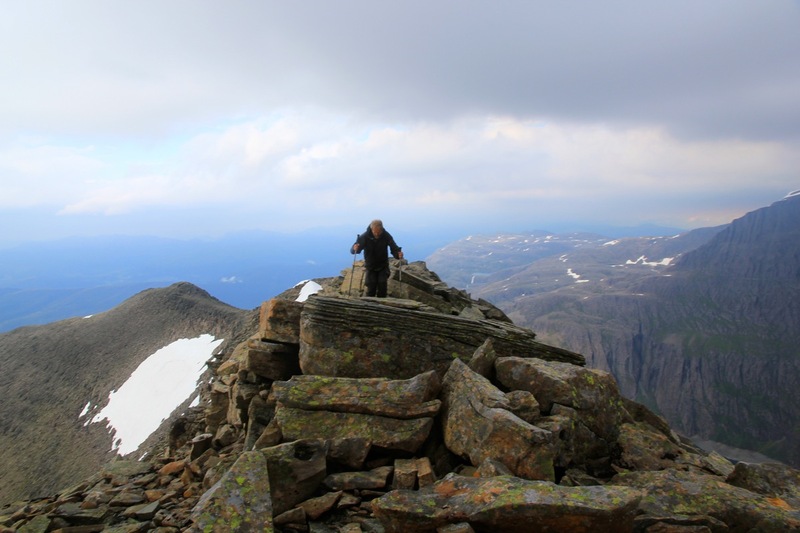 We decided to go for Bukkenibba since it is located a bit outside of normal driving routes and since it seemed that this peak should be visited in the summer. We had no prior clues about this power plant road, since it is not on my M711 map, but also not in the GPS map. In Ålfoten, I asked a local about possible trails to lake Dauremålsvatnet. The man told me that I should drive to the place where the creek from the lake came down, then find a trail going uphill on its right hand side. In hindsight, I realize that IF I had asked about the best place to start in order to climb Bukkenibba, he would most likely have told me about the long (secret!) power plant road and this trip would have been a very different experience. We located the parking and the creek and started out. The sky was full of thunder and lightning as well as some rain, obviously the weather would have to improve before we would reach any kind of high ridge. We started at 1500, but soon lost the trail. As we continued uphill, we ran into a series of cliff-bands and progress slowed considerably. Pål Jørgen was up front, telling me about new obstacles, how to get a good grip on the moss, how to distribute the upward pull to avoid coming off etc. Essentially stating the big difference between climbing on (dry) rock and making upward progress when small trees, moss and blueberry plants are all one can cling to in order to remain on the hill. This hillside compares favorably with a small number of very steepish hills that have been encountered across a span of 20-30 years. At about 400 meter of elevation, life got better in multiple ways. The terrain became easy to walk. The sun broke through and the rain stopped. There were bright yellow, delicious cloudberries everywhere, we simply had to slow down and pick a few handfulls. Also, the view back across the local fjord testified that we had arrived at the west coast. Too good to last, our pretty direct line of walk brought us into cumbersome terrain, huge boulders and dense birch forest. 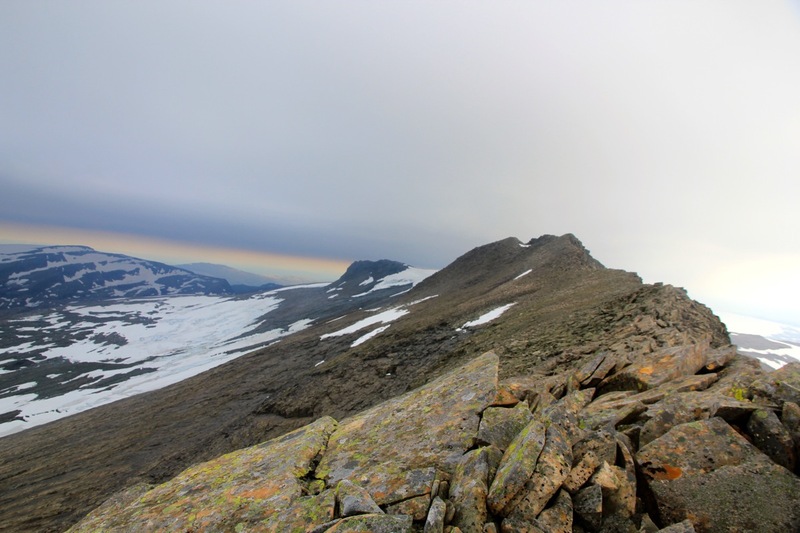 We understood too late that a better path would have been to stay closer to the steep hill while approaching the Bukkenibba ridge in a wide arc. We struggled through and finally started to gain elevation along the lower slopes connecting nicely with the main ridge higher up. Surprisingly, there were signs of rocks and cairns indicating a nice line of ascent. Progress was good until we came close to the first small hump on the ridge, point 1412 on the map. Here, the wind hitting us from the left side, picked up in force. Before long, we had a steady wind around 25 meter/s - full storm. The gusts were stronger, so bad that standing upright became difficult. We got to the big cairn on a local high point and realized that the highest point was still a long way to go. We left the walking poles and the backpack here, secured by a few big rocks, then continued with only the camera. Borderline and very marginal conditions on a mountain ridge, fortunately, this ridge is never narrow. For extended stretches we could only crawl along while holding onto the rocks in order to not fall victim to the will of the wind. 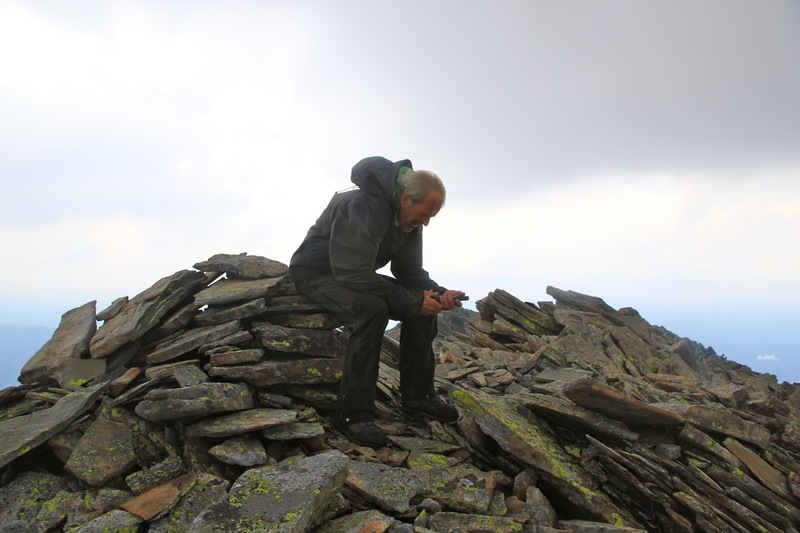 Very slow progress, it took at least 45 minutes from the big cairn to the true summit. We arrived at 2000 - a full 5 hours after leaving the car. I realized that more complications would lie ahead, it would almost certainly be dark by the time we would need to descend the steep, lower hillside. Pål Jørgen seemed to be in a good mood. He felt strong and enjoyed interacting with the strong forces of nature, the wind, the rough landscape and scenery. 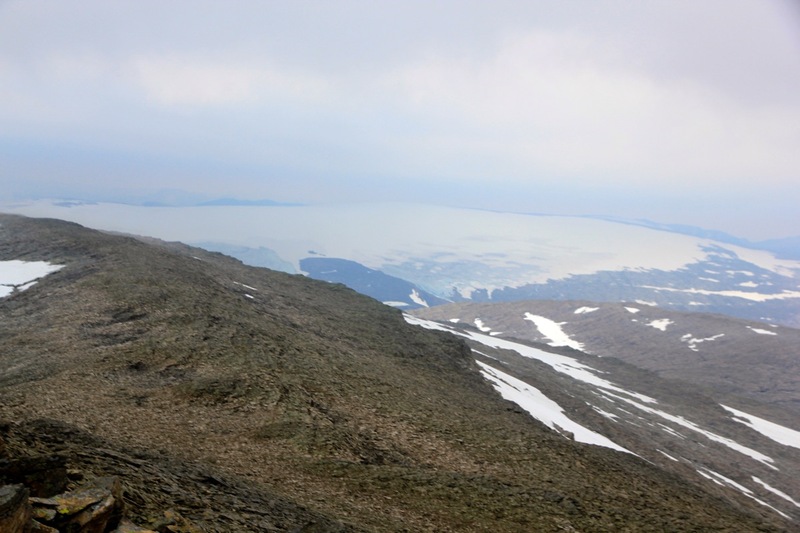 We had a good view down on the Ålfoten glacier as well as across to the bulky Gjegnen. Taking a bit more advantage of the leeward side of the ridge, we made it back to the cairn in about 30 minutes. From here, the conditions rapidly improved. The wind calmed down, it is indeed facinating that a ridge can have 25-30 meter/s wind, while it is only a gentle breeze a few kilometer away. We made a more intelligent choice of route back to the steep, final hillside. The sun had set and we used the remaining twilight to descend as far as possible. Darkness made the final descent slow, and we were happy when reaching the road at 0020. We drove south to Førde and got a ferry from Lavik at 0430, arrival in Bergen at 0630, about 24 hours after we woke up at Rondvassbu. Bukkenibba, as seen from near Dauremålsvatnet.